For the final concert in its 2016/17 season, the South Okanagan Concert Society presented the wonderful, Newfoundland-based, Duo Concertante. Violinist Nancy Dahn and pianist Timothy Steeves are partners in life and partners in music. Seventeen years ago we had first heard this superb duo here in Oliver, on the old Frank Venables Auditorium stage. In the intervening years Nancy and Tim have performed all over the world and received countless awards and accolades. And here they were again, in Oliver, but this time we could welcome them to the new Venables Theatre! Of this year’s high quality concert line-up, this was perhaps the performance I was most looking forward to. In our age of electrically and digitally processed music it is refreshing to spend a few hours enfolded by the natural, un-amplified sound of beautiful instruments. Duo Concertante reminded us what a miracle of sound in skilful hands the grand piano and the violin are! In spite of what one might expect by merely looking at their size, these instruments really were perfectly balanced. The big sound of our modern Yamaha C3 never overpowered the violin. While some brilliant minds in 16th century Italy were designing St. Peter’s Cathedral, creating the sculpture of David and painting the Mona Lisa , others invented a tiny wooden box that can fill a concert hall with sound that speaks straight to the heart—even four centuries later! The concert opened with a seldom heard Sonata in A Major, by J.S. Bach. Instead of featuring a violin soloist with keyboard accompanist, this sonata had the violin and the keyboard on an equal footing. The counterpoint style has a melody being followed by another and often a third always playing catch-up, and each instrument takes the lead at different times. Although old J.S. Bach and the early music crowd might disagree, I think that this sonata works better with piano than with the original harpsichord, since the different voices can be separated more distinctly. From the first movement of this sonata on, I knew we were in for a real treat. Nancy’s superb violin playing let us relax and enjoy the music, without her making us aware of how fiendishly difficult this instrument really is. The audience could sit back and let Nancy do the driving. Just one example: Nancy’s way of doing vibrato. Instead of imitating legendary violinists (Heifetz, Kreisler) with a one-speed, super- fast vibrato on all passages, Nancy varies the speed and intensity of her vibrato. On long notes in the Bach sonata she would come into the note softly with no vibration, and gradually build the volume, adding vibrato and then ending the note softly, again without vibrato. Easier said than done, and very effective. Throughout the concert, the violin became her way of expressing emotion, her personal voice. broad triple stops on the violin. The variations allowed Tim to play some fine solo passages on the piano. This lively piece of music deserves more frequent performances. Concluding the first half of the evening was the Brahms Sonata No.2 in A, perhaps the best known of the composer’s violin sonatas. The beautiful theme of the first of three movements is, I think, well known to violin fans, being on all those “greatest hits” CD’s! Brahms’ life and music are infused with sorrow, dignity and beauty. The slow second movement was absolutely lovely, played by Nancy with that expressive sense of dynamics that draws you in. The highlight of the night for me. This second movement changed in mood and ended with a lively tempo, tricking many of us into thinking the piece was over. The duo must forgive us for applauding; it seemed appropriate considering the magic of the moment. The second half of the concert was given over to the Franck Sonata in A major, jokingly referred to by violinists as the “Frank Sinatra”. Not every violinist is up to performing this piece. It requires absolute mastery of all technical aspects of the violin and buckets of emotional energy. Nancy certainly pulled it off. When I focussed on Tim’s excellent piano accompaniment, it struck me that the piano part in this work is just as impossible as the violin part! I can’t think of a better way to end a wonderful evening than with that cascading triumphal melody that concludes the final movement! After that brilliantly executed and exhausting work, it was surprising that the duo still had the energy to treat us to another technical fireball as encore. They played an arrangement of Kachaturian’s well-known Sabre Dance. Lots of fun! What’s next for the Concert Society? “Piano Chameleons” (two pianos duel it out); “Cheng2Duo” (young brother and sister on cello and piano); “Cari Burdett and Quintet” (gypsy, folk, opera, jazz tunes, cabaret style); “Joe Trio” (court jesters of the classical). The four concerts of the 2017/18 season are already “live” on the ticket section of the Frank Venables Theatre website , as well as being accessible via the theatre box office, Tuesdays through Thursdays, and at 498-1626. Pick your reserved seats as soon as possible! Save $24 on the series, by purchasing tickets to all four concerts in advance! Sharing the memories and art, Sally Franks holds a painting done by her mother,during the weekend fundraiser, Agnes Sutherland “For the Sound of Colour”. Sales yielded $2,450 in sales of art, home baking and canned items bringing the total in the memorial fund to over $7,500. A baby grand piano is in the sights of the organizers who look forward to its debut in the lobby of the Frank Venables Theatre sometime next year. 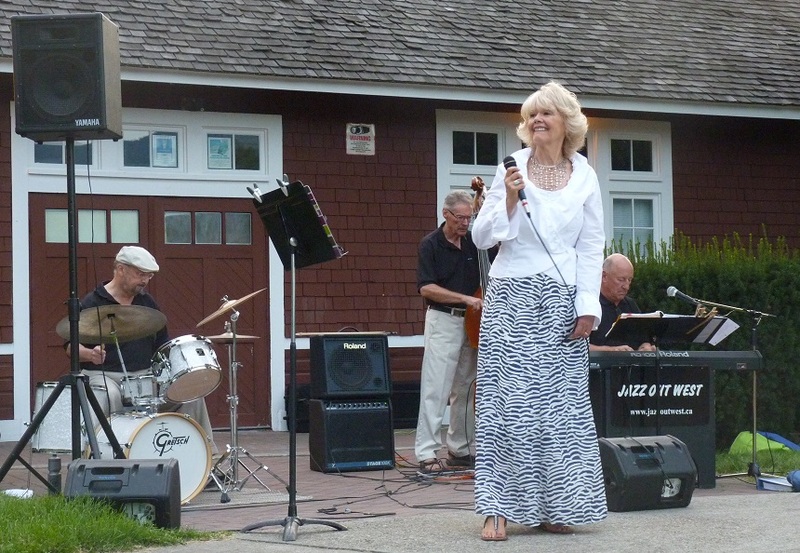 Jazz Out West brought Music in the Park to a close with style on Thursday August 22 at the historic Oliver Visitor Centre.. The three handsome gents (Jim Wyse on keyboard, Bob Larratt on bass, and Bob Park on drums), were fronted by the lovely and sparkling Iris Larratt on vocals. Her smoky contralto reached low for some warm honeyed tones, and Iris handled the mic like a pro to modulate the notes in her upper register. Iris is particularly gifted at connecting with the audience, peppering some of her light-hearted numbers with a husky laugh that made the crowd laugh along with her. Her eye contact with each person gave special meaning to her songs. Jim Wyse shared some banter with Iris, and introduced a few of the numbers. He was all concentration though when tickling the keys. Bob Larratt looked to be having a great time on upright bass, swaying and smiling. And a peak-capped Bob Park was a real cool cat on drums, shrugging his shoulders in time to his beat. Just need some shades to complete the jazzman look! The band performed a lunar theme for the first half of the program in celebration of the full moon: Moon Dance, Fly Me to the Moon, No Moon at All, and Paper Moon, among others. Jazz Out West opened the second half with their signature theme song and performed some crowd pleasers such as the rousing Come to the Caberet as well as many soulful jazz ballads, crooned with Iris’ trademark rivetting interpretations of the lyrics, wringing every emotion out with her expressive face, hands and voice. The seven Music in the Park concerts have been well-attended by some of our most appreciative audiences to date, with generous donations landing this arts council programme securely in the black. Your support means we can continue .bringing the local talent you love and spicing things up with new performers each year. their regular venue at the Oliver Visitor Centre (Oliver Tourism Association) and is appreciative of the collaboration with Oliver Lioness Club on refreshments and Oliver Parks and Recreation and Oliver Kiwanis for the bandshell use for the Penticton Concert Band. Music, “an outburst of the soul”, cannot be quelled in Oliver. Our lovely auditorium smoulders in ruins but the “Old Lady” is safe and sound. Our somewhat elderly Steinway has been a center piece for dazzling world class pianists over the decades. Angela Hewitt, Jon Kamura Parker, Anton Kuerti and, most recently, Sara Beuchner are just a few who have thrilled us with their mastery of the keyboard. Condolences from many musicians who have played here are rolling in as they get word of the fire. They take heart in the story of the Steinway. The story goes this way. Knowing the renovations at the Venables Auditorium could not be completed in time for this season’s concert series, the South Okanagan Concert Society made temporary plans to relocate to another venue, the Oliver Alliance Church. But what to do about the Steinway was the question. A small ‘new piano fund’ had been growing slowly over the years. When it became apparent the Steinway would have to be moved, at the very least, to another part of the school, stored in a secure site with consistent humidity and temperature, tuned a number of times and insured against damage or loss for an extended period while the auditorium was being made ready, the executive decided to seize the moment. This was the time for a new piano. So a partnership was formed with the Adopt-a-Seat Committee and School District 53. By joining forces and using the expertise of Bob Park an arrangement was made to trade in the old Steinway and buy a gently used Yamaha C3 grand piano. A beautiful concert instrument , the Yamaha could be delivered upon completion of the auditorium and the storage cost savings were directed against the replacement cost. S.O.A.P. and the Town of Oliver were all in agreement and the plan took place. So where are we now? The old Steinway is safe in her new home and escaped the ravages of the fire. The new concert piano is on hold and ready to be delivered when a new auditorium is rebuilt. AND we have a series of concerts designed specifically to take advantage of the smaller, more intimate Alliance Church venue to delight us over the winter. Music is alive in Oliver. You can get flex or single tickets at Beyond Bliss. Imperial Office Pro or at the door and be comfortably seated on Friday, October 28th at the new time of 7:30 pm. Alexander Sevastian, originally from Minsk, Belarus and now a Canadian citizen, will magically turn his accordian into a whole orchestra as he showcases amazing dexterity and musicality. Get your tickets quickly. Citizens of Russian descent in Grand Forks went wild for his Kossak Variations and are expected to gobble up tickets here too. Let’s make this the winter Oliver turns grief into joy through music. The Desert Airs Men’s Chorus work their a cappella magic on the crowd at Music in the Park’s opening concert July 8. The Nouveau trio, featuring Chris Stodola on piano, and Lori Stodola (voice) share the opening night with the Desert Airs. Shane Swift and Luke Whittall share some fun moments making indie folk music on July 15th. The ever-popular Dale Seaman delivers great country hits and some of his own songs on July 29th. Singer-songwriter Deborah Lee Puder wows the crowd with her compositions, on August 5th, backed by a trio of great local musicians. The young men of Tusk Mountain ( Travis Eek, Carson Ruhland, and Mike Szalay) rock out on August 12. Ladies’ turn! Zyonya MacKenzie and sister Chenoa sing on August 12. All photos courtesy of Heather Fink. So where will you be on Thursday nights in August? At Oliver’s CPR Station (Visitor Information Centre) of course! See you at 6:30 p.m. Bring a chair or blanket, even a picnic, and a $3.00+ donation!